North American soccer fans may finally have an opportunity to enjoy Japan's fan-favorite, anime-styled Inazuma Eleven, assuming a new listing on Nintendo's upcoming release calendar is to be trusted. 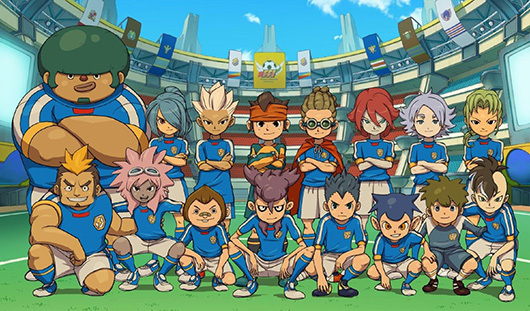 Inazuma Eleven, for those not in the know, is a series of roleplaying games developed by Level-5, the same studio responsible for the Professor Layton series as well as Dragon Quest 8 and its sequel. In short, this is a group that knows how to craft good RPGs, and despite the dissonance created by the phrase "soccer roleplaying game," the Inazuma Eleven series has proven a fan-favorite since its debut. The franchise has even spawned a successful manga adaptation though, like the games, those comics have never appeared in North America. With that in mind, if you visit Nintendo's most recent release calendar, you'll find an unexpected listing entitled "Inazuma Eleven" for the 3DS handheld scheduled for North American release in the first quarter of 2014. That should be happy news, but as Tiny Cartridge states, "everything about this is weird." Despite indications that the game should appear in the very near future, Nintendo has yet to make any announcement regarding the series; that calendar listing is the only word we've seen of this mystery game. Furthermore, the listing makes no mention of which of the Inazuma Eleven entries the calendar might be referring to. It seems most likely that the game in question would be Inazuma Eleven 3 as that game was released in Europe in September, though there's nothing to guarantee this supposition. We've attempted to contact Nintendo, first to see if this listing is an error, and if not, to ask which game is planned for imminent North American release. We've yet to receive a response.